My wife Sandy and I recently saw in concert an electric and eclectic band from upstate New York amusingly named Donna The Buffalo, and afterward I wanted to write about the show. Before sitting down to compose my magnum opus though, I mulled over my approach to the subject matter. The main question I posed to yours truly was: What should the subject matter comprise? Naturally, Donna The Buffalo needed to be a big part of the focus. But you know what? I knew little about DTB pre-gig, and possess only a cursory knowledge about the band now. We went to see them on little more than a whim. I’d heard of them, knew that their history was lengthy, and decided that taking a chance on them would be fun. When my mulling concluded, I was of the opinion that the path that brought me to this show also should be part of the story. I think of myself as a music lover. I listen to a wide variety of genres and have been to well over 1,000 concerts during my earthly tenure. Yet, these days I feel like a tyro when I listen to radio stations or read music-related websites, magazines and newspapers. I mean, more often than not, I am unfamiliar with the musicians. To me, it is just incredible how many solo performers and bands are out there playing the game. In the USA alone, there must be 50,000 professional musical acts, maybe more. In my younger days I thought that I had a handle on a fair percentage of music makers. No longer, not now in the Internet Age when anybody and everybody can make his or her presence felt. And so, ten or more years ago I largely gave up on trying to keep up with the avalanches of musicians plying their trade. It was just too much work, too exhausting. Better, I think, to stay in tune to a lesser extent, and also to take gambles and hope for the best. As with Donna The Buffalo. 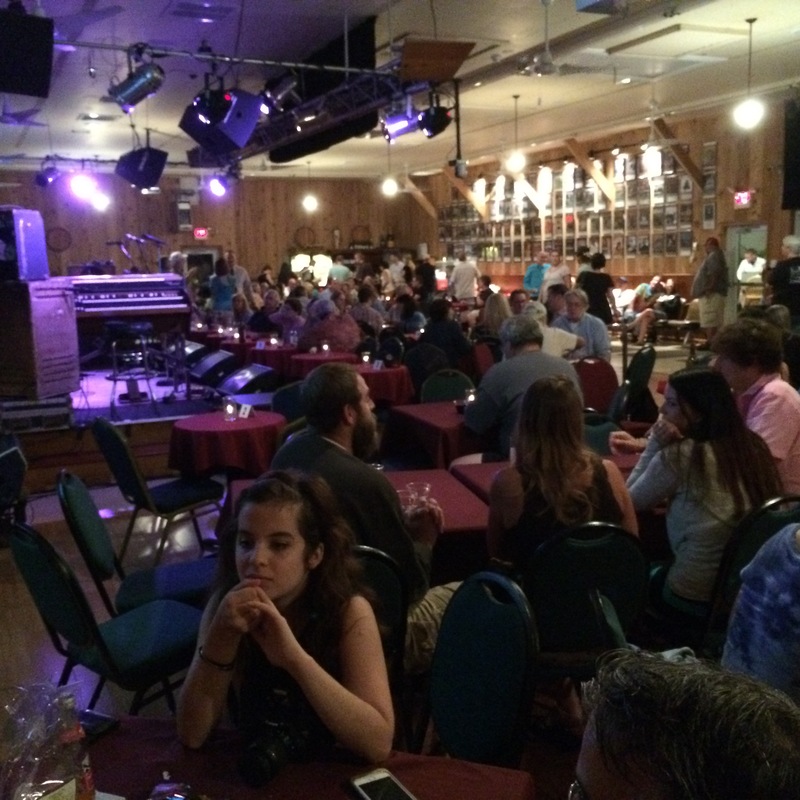 New Hope Winery, one half hour before showtime. Donna The Buffalo appeared at New Hope Winery, a venue in the Philadelphia suburbs that Sandy and I discovered last year and have become very fond of. The joint was packed with 200 or more souls when DTB took the stage. A front-and-center area, where tables normally would be placed, had been cleared to create space for dancers. I looked over the crowd. At some previous visits to the Winery I’d seen demographics heavily tilted to the 50 and above bracket. Not this night. DTB had tipped the age scales downward substantially. Twentysomethings and thirtysomethings abounded. There even were a few very young children in the room. Donna The Buffalo in action at New Hope Winery. What a band. Not having known what to expect, song number one told me that I had chosen wisely by attending this concert. A quintet, DTB was tremendously tight and intuitive all night long, and possessed a large catalog of songs to choose from. 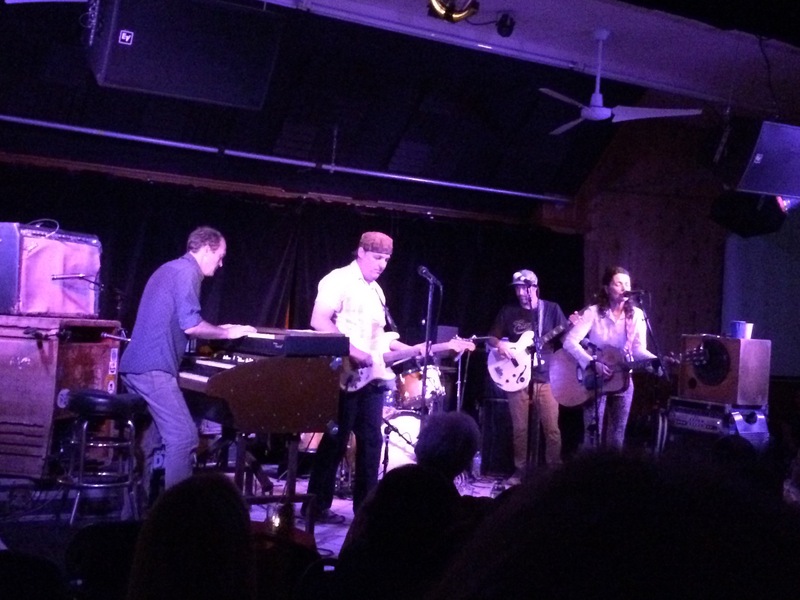 They held the stage for two hours and 10 minutes, filling their long set with 22 songs and little between-tune chatter. I was standing just behind the dance section, which was crowded with bobbers and weavers. After two or three songs, I too began to go with the flow. And kept going. But I was bouncing alone — Sandy stayed at the extremely stage right table to which we had been assigned. Her view of the musicians from there was lousy, but in the dance area she wouldn’t have had a chance seeing over anyone’s head. Mea culpa. DTB has blended a bunch of musical styles into their sound: rock, country, zydeco, reggae. Rock being the dominant force. On some songs (What Money Cannot Buy; Love and Gasoline) the power was relentless, Stonesy, irresistible. On others (The Ones You Love; Conscious Evolution) the groove expanded, contracted, widened once again, giving no mercy to the audience. All you had to do on those expansive numbers, Grateful Dead-ish and Allmans-ish as they were, was close your eyes to be transported to a higher and mind-opening plane. Yes, Donna The Buffalo was that good. DTB began its journey in the late 1980s, picking up steam in the mid 90s, and in the current century has become a decently successful and popular unit. They tour like crazy and have amassed a loyal national fan base known as The Herd, a mini version of the Deadheads. Two original band members (Tara Nevins and Jeb Puryear) remain. Tara and Jeb compose most of the group’s songs, usually individually. At the Winery, each took the lead vocal spotlight on his or her compositions. Jeb opted for the laidback Jerry Garcia approach to singing and handled electric guitar sizzlingly. He’s a guitar hero unknown to 99% of Americans. Tara’s sweet and gentle mountain drawl pleased me much. And she was the band’s multi-instrumentalist. Fiddle, acoustic guitar, accordion, tambourine and scrubboard (for the zydeco numbers) were her arsenal. A bunch of musicians have played alongside Tara and Jeb since DTB’s inception. The three current guys have been around for several years. Mark Raudabaugh killed on the drums. Kyle Sparks was all over his electric bass’ strings, drawing out lines that percolated and sang. And organist David McCracken was immense. So many times in so many bands, especially the poppier or atmospheric ones, the keyboard player is on the lame side, somehow fooling the audience with pretty chords and simplistic runs. Not McCracken. He can play. He jabbed, moved fast, reached for the skies, whatever it took. So, how many acts that I’ve never heard of or barely heard of, and that I’d find to be great, are on the circuit? The question is a puzzle, the answer unknowable. Which makes music and, similarly, much else of life, delightful.